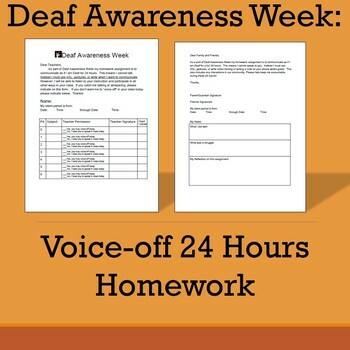 This is a fun activity for Deaf Awareness Week. 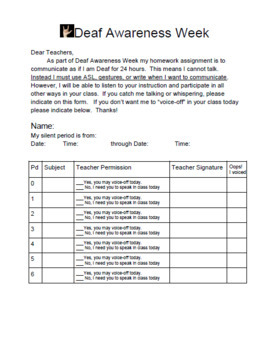 Not only does it challenge your students to use their ASL knowledge to communicate with those around them, but it also allows others to learn how to communicate using new methods. Your students might be frustrated at first, but most students can find ways to communicate (especially with technology). Make sure you clearly explain to students that they are not suppose to pretend they are Deaf (that would be culturally inappropriate). 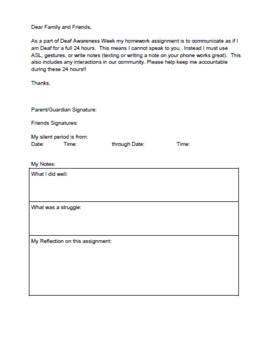 Microsoft Word doc- fully able to edit to fit your needs.